Well I comments out the section of code and the error went away, but not sure if I broke something else in the plugin or not. Any ideas? What would break if I try to comment this out? Any ideas why? I’m on version 2.9.8 of your plugin. Here is line 152. Which starts with foreach. Ranks if part of the parent CubePoints plugin. It’s a module you have to activate. Not sure what the code is to display it in the sidebar via php. I’d post this in the official cubepoints.com forums. CubePoints only supports whole numbers sorry. Version 1.9.8.1 will fix the admin bar issue. It just pushed the update. So should be live with 15 minutes. I modified the admin file by simply removing all (int) casts about a month ago, allowing our admins to enter decimal point values. Points have been awarded correctly for the past month or so. Many functions of the plugin still do not support decimal values (i.e. Manage points) but I think it would be a straight forward and very well received change. I’ll take a look at that admin menu bar tomorrow. Version 1.9.8 is live! Includes bbPress 2.0 support. And a way to limit access to updates / replies based on their point value. It’s something I can look into for a future version. New update coming this weekend. Will include support for bbPress 2.0! Sigh .. getting sick of human spammers creating accounts and posting a lot of updates / replies to get points. I’ll add a option in the next update so they need a certain point value before they are able to do update / replies. New update is live and we just got over 23,000 downloads! Yay! Doing another update this week. I was sick of “human spammers” joining my site and creating all these groups. 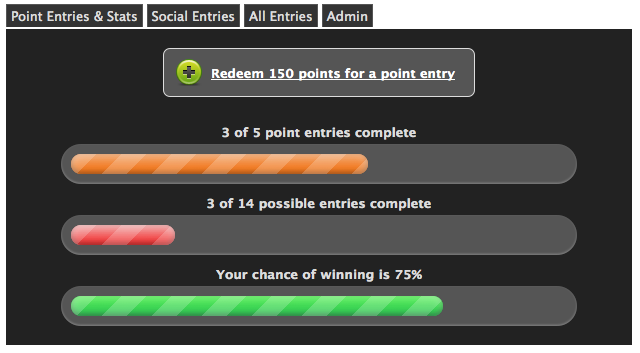 So I’m going to setup a way to not allow them to create a group unless they have a set amount of points. Ok, closing this thread. Please see the new topic here. That will have a link to more info about it and how to get it. Added another feature to it this morning! Hot off the coding press. If your a lottery admin you can pick winner(s) at random right from the lottery logs on the front end! Not sure myself. Haven’t tried any translations yet. Are you talking about the .pot file? Ok, it is COMPLETE! Here are the main features.